We're so that excited you are considering participating in volunteer/mission/outreach opportunities with FUMCR! The list below includes specific current and upcoming opportunities. We also have many ongoing mission/outreach groups and groups that support FUMCR that you may choose to assist and join. Does your group/event need volunteers? Submit the form at www.fumcr.com/addneed. BrowseWhere does the volunteer job take place?Who benefits from this job?When does this job start?What commitment is asked? Worship bags are available at several Sanctuary entrances and contain colors, stickers, and other various crafts to provide children tools to express what they are learning during the service. 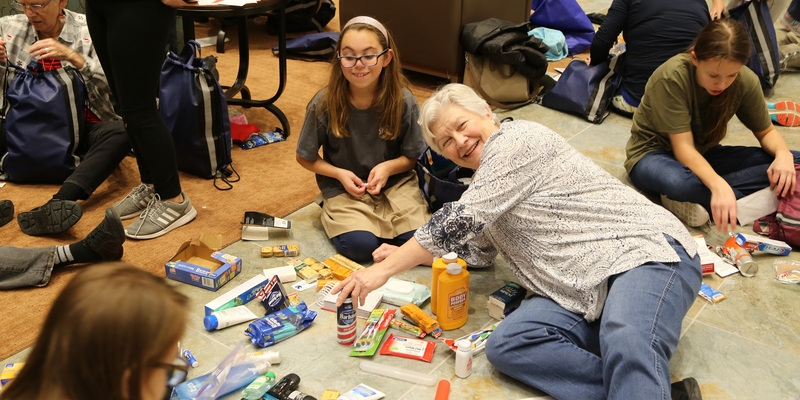 Weekly, we need adults to clean out and restock the Sunday Worship Bags for the children who attend worship. When you sign up to prepare bags for a specific Sunday, please remember that you have the entire week prior to this date to come in and prepare the bags. Feel free to sign up for as many weeks as you would like! For a fantastic way to encourage children to be an active member of our Sunday worship congregation, please sign up for the dates you can volunteer via the Signup Genius link. This is NOT an exhaustive list of the myriad volunteer opportunities through FUMCR. This is a list of actual volunteers needed NOW or VERY SOON. If you can help or have questions, click I'm interested! to send an email to the coordinator. You should be contacted within two business days. For other volunteering suggestions, visit ONGOING VOLUNTEER OPPORTUNITIES or fill out our VOLUNTEER INTEREST FORM. Does your group need volunteers? Submit the form at WWW.FUMCR.COM/ADDNEED.